small round structured viruses (SRSV). “Stomach flu” is not related to influenza, which is a respiratory illness. 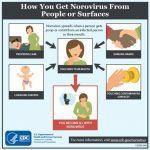 Transmission/Incubation: Symptoms of norovirus illness usually begin about 24 to 48 hours after ingestion of the virus, but they can appear as early as 12 hours after exposure. 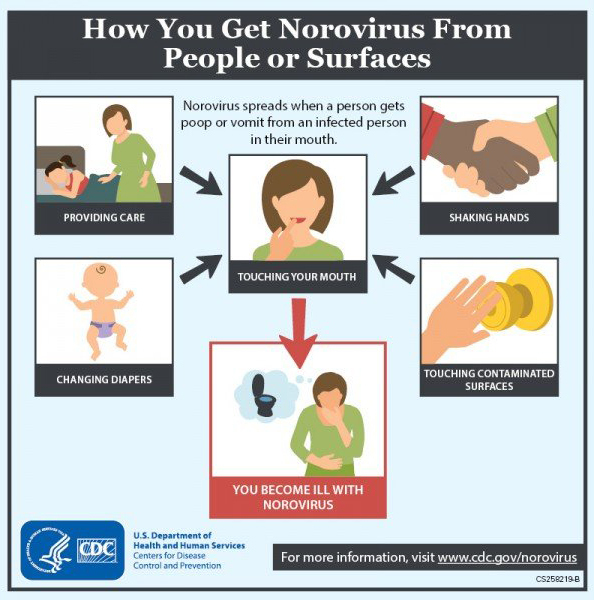 Noroviruses are very contagious and can spread easily from person to person. Both stool and vomit are infectious. Aerosolized spread may be possible. Particular care should be taken with young children in diapers who may have diarrhea. People infected with norovirus are contagious from the moment they begin feeling ill to at least 3 days after recovery. Some people may be contagious for as long as 2 weeks after recovery. Symptoms: The symptoms of norovirus illness usually include nausea, vomiting, diarrhea and some stomach cramping. Sometimes people also have a low-grade fever, chills, headache, muscle aches and a general sense of tiredness. The illness often begins suddenly, and the infected person may feel very sick. The illness is usually brief, with symptoms lasting only about 1 or 2 days. In general, children experience more vomiting than adults. Most people with norovirus illness have both vomiting and diarrhea. Treatment/Prevention: Currently, there is no antiviral medication that works against norovirus and there is no vaccine to prevent infection. Norovirus infection cannot be treated with antibiotics. This is because antibiotics work to fight bacteria and not viruses. Norovirus illness is usually brief in healthy individuals. When people are ill with vomiting and diarrhea, they should drink plenty of fluids to prevent dehydration. Dehydration among young children, the elderly and the sick, can be common, and it is the most serious health effect that can result from norovirus infection. By drinking oral rehydration fluids (ORF), juice or water, people can reduce their chance of becoming dehydrated. Frequently wash your hands with soap and water, especially after toilet visits and changing diapers and before eating or preparing food. Hand sanitizers aren’t as effective as washing with soap and water at removing norovirus particles. Flush or discard any vomit and/or stool in the toilet and make sure that the surrounding area is kept clean. Do not vacuum carpets or buff floors during an outbreak as this has the potential to re-circulate virus particles. Food Handlers who have nausea and vomiting should not prepare food while they have symptoms and for 72 hours after they recover from their illness. Health Care Providers who have nausea and vomiting should be excluded from work while they have symptoms and for 72 hours after they recover from their illness.